Being a store manager in any business can be extremely challenging. There are so many tasks to work through on a daily basis. BrandM8 can assist teams by reminding them of what needs to be done and when, with automated digital tasks and intelligent checklists. Unlike paper checklists, the results are automatically collated into daily/weekly or monthly reports, accessible both at store and HQ. The BrandM8 App will help you mitigate risks and manage safety compliance across your company via the cloud based platform. 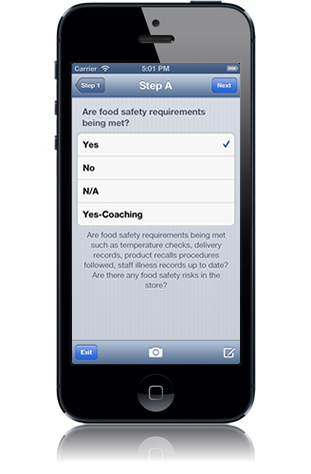 Checklists and tasks are then completed via the App using a tablet, smartphone or laptop, and can record photo evidence, temperature readings, barcode scans and comments. Detailed reports are produced to highlighting underperforming units and key issues. Cloud based management of audits, checklists and reporting. Works on iPhone, iPod Touch, iPad, Android and Windows Mobile devices. Audits and checklists are customised to suit your business requirements. Automatic creation of follow up checklists according to the answers recorded. Blind scoring can be configured for each question and reported on. Audits can be scheduled for specific days and times. Each question can be weighted to reflect it's importance. Guides users through checklists and audits according to how a question is answered. Smart tags can be used to ensure that checks are done at the correct location. Record photo evidence using the camera within the mobile device. Cloud based reporting provides instant access to audit data and compliance status. Bluetooth temperature probe integration ensures accurate temperature readings. Individual user accounts record who and when an audit was completed. Capture audit and checklist data from multiple sites across any geography. A variety of question types are available for inclusion within an audit.